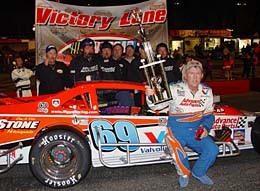 Junior Miller may have 39 SMART Tour wins to his credit, more than any other driver, but he hadn't experienced the sweet taste of victory in a Modified Tour race for quite some time. Now, the man they call the “King of the Southern Modifieds” has won a bunch at Bowman Gray Stadium over the past few seasons, but as far as the SMART Tour and the newly formed NASCAR Whelen Southern Modified Tour, Junior has had a blank space in the win column for a while. That last win came on October 27, 2002 at Caraway Speedway (NC). Miller's return to Victory Lane came 902 days later at the very same track. Miller methodically made his way through the field over the course of the 150-lap event. But when he got to second, he knew he then had to face his biggest rival. 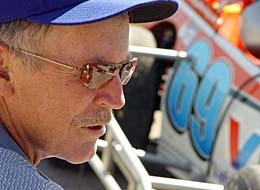 Burt Myers, a driver with whom he has clashed with so many times, stood between he and his long-awaited win. Miller knew he had to either go around Myers or through him to reach that elusive win. And with an anxious crowd watching, Miller cleanly passed his nemesis to take the win. Many of the fans at Caraway were probably surprised with the respect these two heavy-weights showed each other while battling for the win during the closing laps. The Myers-Miller rivalry is one of the greatest racing rivalries in the southeast, and maybe in all of Short Track racing, and usually provides the fans with some sort of juicy late-race drama to talk about on the ride home. Myers knew he was beat and admitted he actually didn't mind seeing Miller win. 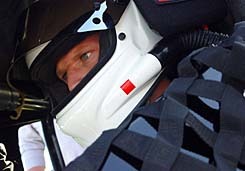 “Junior drove me the way I would have drove him and that is all I can ask for,” said Myers after his second-place run. “My hats off to Junior and Riggs Racing. They've been struggling like we have been, especially down here and I don't mind it. I know people will find this hard to believe, but I don't mind seeing Junior win. “Riggs let us borrow two front shocks before qualifying last week and it really helped us with the car and the win last week. Me and Jeff Riggs and his guys get along real great. Now, me and Junior have had our run-ins in the past and will probably have some more. “We can get along a whole lot better here together than one of my fans and one of his fans in the stands. They would kill each other. And Myers knew that with only a handful of laps to go and a loose racecar that he was merely a sitting duck. You may think that starting 12th, as Miller did, would have meant using up a racecar up to get to the front. But the veteran saved his right rear tire and had more rubber than Myers in the closing laps. “I had to save tires all night,” said Miller. “When I caught somebody I would just wait for them to make a mistake and jump by them. I wouldn't pressure them much. I might touch them a little bit and get them excited going into the corner a little too hard. I would run by them there. So doing that, I was able to save the right rear all night and it paid off. It is a long time to wait; 902 days and 30 Tour races. And the wait may have been the reason this win was so great for Miller. 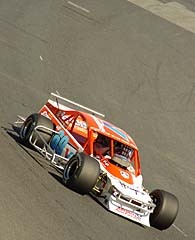 Plus it was Miller's first win in the record books of the new NASCAR Whelen Southern Modified Tour. The veteran Mod driver showed that emotion to the fans at Caraway when he climbed from his #69 Mod in victory lane. 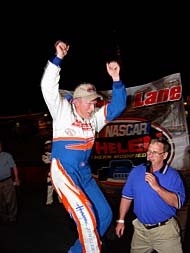 Miller hopped up on the left-front tire, a celebration tradition for him at Bowman Gray Stadium, and saluted the fans. But in doing so, Miller stumbled on the Hoosier rubber and fell hard onto the ground. But Miller got up and dusted himself off and did his post-race interviews. Myers had a great view of Miller's victory lane celebration. Although Miller may have some bruises from his fall in victory lane, I bet he wouldn't trade those victory bruises for anything. After 902 days nothing can spoil the feeling of winning. Junior begins his fall from his on-tire celebration after winning his first NASCAR Southern Mod Tour race.